Apple launched a redesigned Mac in Business webpage on Wednesday to better target its growing presence in enterprise, highlighting corporate success stories, a special section detailing its partnership with IBM and reworked marketing literature focusing on individual productivity apps. It's "a brand new day for business," Apple boldly claims at the top of its new business-oriented Mac in October, saying only 5 percent of users need phone support, compared to 40 percent for Windows boxes. According to Fletcher Previn, IBM's VP of Workplace-as-a-Service, the recent Mac rollout saves the company an average $270 per machine over Windows devices in deployment and security costs. Apple goes on to say IBM currently has more than 130,000 Macs in circulation. IBM officials in July said they expect up to hand out 50,000 MacBooks to employees by 2015, with a total Mac count hovering between 150,000 and 200,000 once the program is complete. 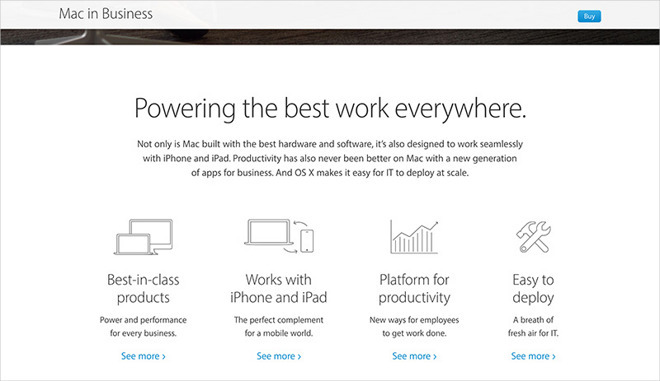 Along with IBM's section, Apple pitches four main categories on its Mac in Business webpage, touting hardware and software benefits, compatibility with iOS devices, OS X platform features and ease of deployment. Interspersed throughout the page are endorsements from IT chiefs working at CDM Group and iVenturesHealth, Kelly Services and SAP. Apple is pushing hard in the enterprise solutions space as it looks to expand beyond a saturated consumer market. During an interview in September, CEO Tim Cook said enterprise sales brought in $25 billion over the prior 12 months, amounting to 14 percent of Apple's revenue for the trailing year.